During the Civil War, the Federal Government held thousands of prisoners of war at a facility on Johnson’s Island in Lake Erie’s Sandusky Bay. Between 1862 and 1865, the government confined more than 10,000 Confederate officers at the camp. Those who died while imprisoned were interred in a cemetery on the northern end of the island. In 1931, the United Daughters of the Confederacy donated the one-acre property to the U.S. government. More than 200 Confederate officers and enlisted men are buried in the cemetery, memorialized by a statue of a Confederate soldier looking out over the graves. Early in the Civil War, the Union command saw the need for prisoner of war camps. Existing facilities, usually located at military sites, proved inadequate for the number of prisoners. In 1861, Union Lieutenant Colonel William Hoffman selected Johnson’s Island for the site of a new prison. Hoffman found the 300-acre island easily defensible and close to rail lines in Sandusky. Hoffman negotiated a lease with the island’s owner, Leonard Johnson. Under the contract, the government leased half of the island for $500 per year, with the understanding that the U.S. government would control the entire island. Construction of the prison’s stockade, barracks, and support buildings began in the fall of 1861 on the southeastern side of the island. The prison compound consisted of 16.5 acres. The first prisoners arrived in April 1862. When it opened, the prison held both Confederate officers and enlisted soldiers. Due to the island’s defensibility and distance from the front lines, the U.S. Secretary of War ordered that Johnson’s Island hold only Confederate officers. During the first few years of the Civil War, both sides regularly exchanged prisoners, and thus the population remained low. The Johnson Island prison was designed to hold no more than 1,000 inmates. However, after the exchanges ceased in October 1863, the prison’s population swelled, reaching a peak of 3,256 in January 1865. The prison’s commanders established a cemetery on the northeast side of the island, north of the prison stockade. More than 200 inmates died over the prison’s 40-month period of operation. Deaths were largely attributed to disease and illness. While conditions on Johnson’s Island were not as harsh as in prisons for enlisted soldiers, lack of appropriate sanitation, overcrowding, and inadequate shelter and food were common issues, especially during the final years of the war. In September 1864, Confederate agents operating in Canada plotted to raid the island. The agents successfully seized two passenger steamers in Lake Erie and planned to capture the USS Michigan and use the warship to free the officers on Johnson’s Island. While the agents aborted the mission, Union commanders feared other attacks, and built defensive forts around the island. In the months following Robert E. Lee’s surrender in April 1865, the number of inmates on Johnson’s Island began to decline. Most obtained their release in April following an oath of allegiance to the United States. Between May and September 1865, the military transferred the remaining Confederate officers to other facilities. The U.S. government abandoned the island in November 1865, reverting control of the island to Leonard Johnson. Following the war, Johnson continued farming and started quarry operations on the island. In 1878, the U.S. Congress appropriated funds to acquire the Confederate cemetery from Johnson. He refused, and the property remained in his control. In 1890, officials from Georgia raised funds to construct an iron fence to enclose the cemetery and erect marble headstones at each of the graves. An iron archway stands at the entrance closest to Sandusky Bay. In 1904, the United Daughters of the Confederacy purchased the cemetery, donating it to the U.S. government in 1931. The cemetery remains as the only link to the island’s prison history, as residential development has erased much of the archeological record from the Civil War era. The one-acre cemetery is a narrow rectangle, 100-feet wide and 485-feet long, that contains four memorials of various shapes and sizes. The oldest of these is a bronze statue of a Confederate soldier standing on a granite base. Sculpted by Moses Ezekiel, the soldier looks out over the graves. The Daughters of the Confederacy dedicated the monument in June 1910. The United Daughters of the Confederacy installed two monuments at the cemetery in 1925. The Mack-Hauck Memorial honors two members of the organization instrumental in preserving the Johnson’s Island cemetery. The Mary Patton Hudson Memorial pays tribute to the woman who led the effort to purchase the cemetery. In 2003, the United Daughters of the Confederacy erected a set of granite markers dedicated to Confederate prisoners of war. The memorial records the organization’s work to identify additional remains in the cemetery. 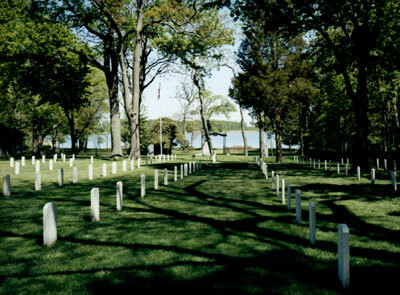 While only 206 grave markers stand in the cemetery, 267 individual remains were found using ground-penetrating radar. 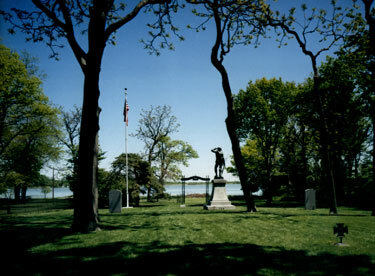 Confederate Stockade Cemetery is located on Johnson’s Island in Sandusky Bay in Lake Erie. The Johnson’s Island Causeway (toll required) carries traffic from Lakeside Marblehead, OH to the island. The cemetery is open for visitation daily from sunrise to sunset. Ohio Western Reserve National Cemetery oversees the cemetery; its administrative office is open Monday to Friday from 8:00am to 4:30pm. The office is closed on all Federal holidays except for Memorial Day. For more information about the Confederate cemetery, please contact the national cemetery office at 330-335-3069, or see the Department of Veterans Affairs website. While visiting, be mindful that our national and Confederate cemeteries are hallowed ground, and be respectful to all of our nation’s fallen soldiers and their families. Additional cemetery policies may be posted on site. The Johnson’s Island Preservation Society is a nonprofit association dedicated to protecting and preserving the cemetery site. Heidelberg University and the Friends and Descendents of Johnson’s Island Civil War Prison works to protect the archeological significance of the island through research and preservation measures. Johnson’s Island was designated a National Historic Landmark in 1990. Click here for the National Historic Landmark registration file: text and photos. Confederate Stockade Cemetery was photographed to the standards established by the National Park Service’s Historic American Landscapes Survey.